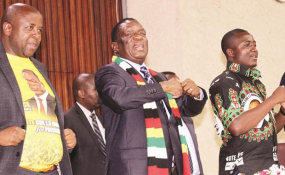 Zimbabwe: You Have Failed Zimbabweans - ED, Running a Country Is More Than Just Mantras! President Emmerson Mnangagwa and Youth leaders Pupurai Togarepi and Lewis Matutu. The author deplores the rapidly deteriorating socio-economic and political situation in Zimbabwe one year after President Mnangagwa took office. As I watched children going to school at the beginning of the term, I could not help but be troubled by how few they were - an indication that a huge number of them would not be attending, due to unaffordable school fees, uniforms and stationery - thus, a whole generation would be denied an education. Why? Why is a country that used to pride itself with one of the best education standards, and highest literacy rates on the continent, now a pale shadow of its once glorious past? Zimbabwe is already on an economic downward spiral, especially over the past two months - as shortages of fuel, medication at public hospitals and foreign currency, as well as the tripling of prices of basic commodities, medication at private pharmacies, school fees and uniforms cripple the nation. It is also reported that a number of companies will not be re-opening this year after the holiday break. Such is the country we live in ever since Emmerson Dambudzo Mnangagwa took over power, after a military coup d'état in November 2017...A country that had been relatively economically stable in the latter days of ousted President Robert Gabriel Mugabe's disastrous, oppressive and brutal regime. The question is why has Mnangagwa failed the nation this way - economic problems re-emerging even before his first anniversary of coming to power? The president seemingly was big on talk and mantras, and generally empty of substance. It is one thing talking lyrically about "Zimbabwe being open for business", and "Zimbabwe being an upper middle class society by 2030" - and, something completely different actually getting to the practicalities of implementing policies that will result in the fulfilment of these mantras. For instance, a supermarket may promote itself as being "Good for you! ", yet not doing anything to ensure that it is actually good for us - probably, with rude staff, exorbitant prices, and lacking generally required products. The same goes for Zimbabwe - it can never become what the Mnangagwa regime touts it to be, yet busy sitting on their laurels, and doing absolutely nothing to rectify the situation. A country is not run merely on mantras, but on effective implementation. This is, however, not even a new weakness within the Zimbabwe African National Union- Patriotic Front (ZANU-PF) regime, as none of its economic recovery programmes ever came to fruition since independence from Britain in 1980. None, whatsoever! No wonder, only ten years after inheriting a relatively economically prosperous country in 1980 - withstanding intensive United Nations sanctions and a gruesome civil war (second Chimurenga) - the ZANU-PF regime was already implementing Bretton Woods' economic structural adjustment programmes. In a nutshell, ZANU-PF started destroying the country's economy the very first day they entered office! Today, the same ruinous regime wants the people of Zimbabwe to continue having hope that this time they will get it right and recover the economy! Recovery, my foot! How can a regime that had made a 38 yearlong career of ruining the economy, suddenly get it right? The facts on the ground prove otherwise. The accessibility of foreign currency on the streets of all the major cities and towns of Zimbabwe proves that it is available in the country, yet the ZANU-PF regime deliberately fails to reign in this malice. Who does not know where the foreign currency dealers are based? Even our police service knows where they are to be found, as these dealers operate openly on the streets. If the regime were serious, they would simply send plain clothed police officers with some cash, pretending wanting to exchange it for other currencies. All these street foreign currency dealers could be off the streets within a week - and all that money reintroduced into the formal system. The fact that there is so much foreign currency available on most streets of all our major cities and towns means that the country has enough to buy fuel, medication, and even provide all those who would want to import necessary raw materials. This would result in basic commodities reverting to their original prices. The fact that the ZANU-PF regime could go on national television sobbing and mourning that they did not print United States dollars - and could neither pay civil servants in hard currency, or provide adequately to importers - is nothing short of ridiculous. Just how much foreign currency is the Mnangagwa regime allowing to be traded on the streets, yet the Reserve Bank of Zimbabwe is dry? Can we say that the regime is serious when it hires jokers to work for the ministry of finance to "expose" corrupt people in the Reserve Bank of Zimbabwe - accused of re-directing this much needed hard currency onto the black market - only to confess to having being paid to "whistle blow", without any concrete evidence? What manner of shenanigans are these? Does this regime take us seriously - or they perceive us as fools? Additionally, how can the country be "open for business", and become "an upper middle class society", whilst businesses that could have established operations within the country, know that the only way they would acquire hard currency is on the streets of Harare, Bulawayo, Gweru, Mutare or any other city - at absurd exchange rates? No serious investor would ever make such an ill-advised move - it is one thing to take risks in business, and completely another to be downright foolish. As the nation's troubles continue, the Mnangagwa regime is not even doing anything to ensure that those businesses currently operating in the country are paying their workers enough - or even paying them at all. The regime's own workers have to resort to half-hearted strikes, and threats of strikes, just so that they are given a living wage. Of course, this callous regime will most likely never resolve these workers plight - as we have witnessed numerous times before - unless civil servants show a bit more back-born by engaging in more serious constitutional industrial action; something even the rest of Zimbabwe can join in. All of us in Zimbabwe are suffering under this regime - and economic brutality is the worst form of human rights abuse - and, we are more than prepared to embark of protracted constitutional action, until our voices are finally heard. What upper middle class society is the regime creating with such anti-people policies? An upper middle class society is not made up of paupers and beggars - unless, if the ZANU-PF regime has another definition. To make matters worse, our children are no longer going to school, as parents cannot afford the exorbitant school fees, uniforms and stationery. What type of an upper middle class society is the regime planning of seeing in 2030? With a nation of unschooled adults - who will most probably, resort to a life of crime, thuggery, and drug abuse -do Mnangagwa and company seriously envision a nation of prosperous people? Our nation is on the path of doom, unless the ZANU-PF regime finally takes its responsibilities seriously. This is not some so-called "prophesy of doom", but a tragic reality. No different from warning someone with a propensity for drunken driving that they will soon be involved in a gruesome accident. It is a fact that the Mnangagwa regime needs to heed - as a nation can never be built solely on mantras and mere talk. Such an approach only worked at platforms such as the World Economic Forum at Davos, when Mnangagwa was still a fresh face on the global stage, and other global leaders needed to "hear" what his plans were. However, this is now more than a year after coming into office, and world leaders no longer want to "hear", but want to "see". What they are seeing is no different from what we, in Zimbabwe, are seeing - lack of seriousness in fighting corruption, widespread inertness in solving the country's problems, and lack of interest in improving lives of workers. All that global leaders are seeing is a resurgence of political persecution - the climax being the 1 August 2018 post-election tragic fatal shooting of at least six unarmed people by what the Mothlante Commission said was at the hands of security forces. All these signs do not exactly galvanise confidence in the Mnangagwa regime, but, in fact, is evidence that Mnangagwa and company know not what they are doing. *Tendai Ruben Mbofana is a social justice activist, writer, author, and speaker. He is the Programmes Director with the Zimbabwe Network for Social Justice.